Sick of slogans emblazoned on merchandise yet? I'm not! Perhaps my 'rate it' for all things wordy comes down to the fact that I don't actual *own* much of this type of thing. I love the fun vibe they evoke. I just haven't purchased them for my own use. And while we're on the topic of words to live by... the same message is given the musical treatment in this ol' gem from my fave, The Divine Comedy. 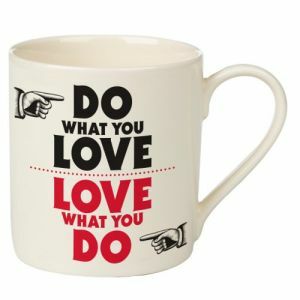 "Love What You Do", indeed. Enjoy! And I never, ever get tired of Neil Hannon and the Divine Comedy.